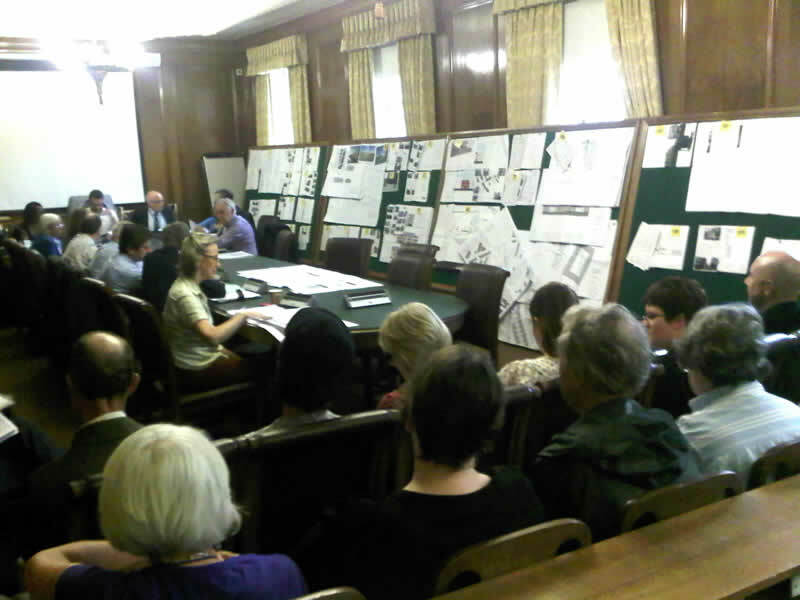 On Tuesday, 23rd July 2013, the Planning Application Committee approved the new planning proposal for the Ram Brewery during a special meeting, with only the 2 Labour councillors voting against. Tory councillors found excuses such as Wandsworth Town station is congested because passengers gathered in the wrong place and expected to get in the nearest coach, some building could be excluded from the gas golder risk zone because not many people will live in them, no-one will notice the 36-storey tower when they are out shopping there… all good lines to make the gallery laugh, but it was sadly the future of the borough at stake. The gallery was full, plus an extra row in front and a few people trying to see from the door. Committee meeting room 123 (on the left the Tory Councillors, on the right, the Labour, at the end the Chair surrounded by the officers. The meeting started off with general information provided by the officers, with presentation and slide-show on a large video screen. The scheme includes the erection of a 36 storey building, along with many 9-12 other buildings, at the heart of the conservation area, beside a number of listed buildings: the Grade II* listed Ram Brewery building, the Grade II listed Brewer’s House at 70 Wandsworth High Street, and at the northern end of the site, a Grade II listed stables, as well as some later additions from the nineteenth and twentieth centuries. Wandsworth Society image of the Brewery Tap taken with a 50mm lens. To obtain as complete a view of the buildings as seen with the naked eye the viewpoint has to be moved back to the Court House building in Garratt Lane where the true impact of the development will be registered by pedestrians and motorists alike. General talk followed about improving the area. There was some discussion about Wandsworth Station and how much more human traffic it could take. Some-one supplied some optimistic statistics, but another conservative Councillor said words to the effect of ‘never mind that, the station can’t take any more, I use it!’ They said that the lengthening of the platforms was just about completed and suggested that passengers gathered in the wrong place and expected to get in the nearest coach (derisive laughter from the gallery). Effectively this was flak about Wandsworth station to deflect it from being a serious consideration with respect to the proposed development. (third band which contains the 36 storey tower) just to be in a very dodgy situation. They tried to exclude one of the buildings in the second band on the basis that there wouldn’t be many people in it (more laughter from the gallery) and include it in the third band but later a councillor objected and this has been overruled. People were told the Gasholder is due to be decommissioned in 2017 and, in the interim, occupation of buildings will not be allowed in bands 1 & 2 although they can be built. Some-one raised the problem of empty buildings standing around, and won’t that be a blight? Answer: well, that is the developers problem not ours. You might like to know also that the building where ALL the 66 affordable dwellings (shared ownership only – no social housing) are grouped is the closest from the gasholder and therefore won’t be occupied until the tank is fully decommissioned. Cllr. Tony Belton bought up the real subject of contention; the proposed height of the now-only-one tower of 36 stories. (Murmuring from the Gallery) He said that it would harm our environment, mentioned views from various locations and how they would be unpleasant. As usual there was little mention of how ALL the local amenity groups were against it. At some point, cllr Cuff, on the whole fairly reasonable as chairman, did raise the English Heritage issue: their letters clearly stated that the development did harm to the listed buildings but it was down-played by officers. Dave Clark spent 10 minutes wading through the file, explaining that “harm” was not as bad as “extreme harm”. Ah, so that’s okay then! Councillor Michael Ryder (a new member of the committee – and he said in an email he thought “long and hard before casting [his] vote on this proposal“) said the tower was a ‘magnificent statement’ otherwise we would just have a lot of boring buildings he added (which begs the question of WHY they let the other building BE boring!). Maybe he should have thought longer about what to say? Two other councillors praised ‘tall buildings’ using the usual clichés like ‘iconic’ and ‘vibrant’ and ‘gateway to Wandsworth’ (some Conservatives even said they would have preferred a taller tower!) and then said, ‘I am sure no-one will notice it when they are out shopping’ …which seemed a bit contradictory! (hoots of laughter, shouts, and protests from the gallery). The supposed planning guidelines for Wandsworth were once again breached. The excuse being that the developers revised plan adhered to more of them than the previous, rejected application. The Chairman (cllr Nick Cuff) proposed acceptance but Labour cllrs Belton and Randall demanded a vote on the rejection of the proposal. The motion was rejected and all Conservatives voted in favour of the scheme – including cllr Heaster, who again spoke eloquently against it (again, it seems that nothing will change until there is a political shake -up in Wandsworth); and of course it went through, to cries of ‘shame’ from the gallery. ‘Whilst the officer’s report recommends approval, it does so on the grounds that the scheme does the least harm to the historic Town Centre. For a scheme that is neither ‘wholly exceptional’ in design, nor required on wholly exceptional grounds, it is in defiance of the Governments National Planning Policy Framework in terms of its massing and scale and will do irreparable ‘harm’ for generations to come to the Town Centre. 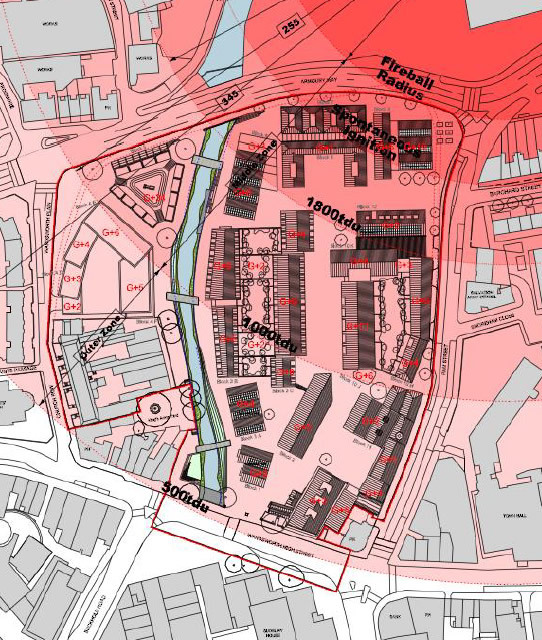 The need for redevelopment of the Brewery site is not in dispute, but to approve an inappropriate scheme because it does the least harm is quite unacceptable in town planning terms and the officers report should have concluded this’. This saga is shameful, the behaviour of Councillors absolutely appalling and unacceptable. I wholeheartedly hope an appeal can be launched against this approved planning application. It is time to vote them all out. The Conservatives have been in charge of the borough for too long and believe they can walk over everybody. I agree with Ivonne. By the time of the 2014 elections the current lot will have been in office for 38 years. Regardless of ones politics that’s bad for good governance. Too long for any one party and as a result we have partisan officers who only act on behalf of the developers and Council, failing to represent the interests of existing residents at every stage. Consultation is entirely meaningless in the hands of this Council. Any expression of concern for residents is lip service only. The approval of the 36 storey high rise monster proposed at Ram Brewery at the very heart of Wandsworth is a brutal reminder of what residents face at the hands of this hideous planning department. More lies and high rise. We need independent candidates to stand at the next election in every ward across the borough. It is the only way to stop WBC from selling off Wandsworth to greedy, opportunistic developers. It is the only way to engineer a change in vision and attitude among Councillors, Management and Council Officers. 36 storeys across the borough, contradicting even the Council’s own policies on tall buildings, is precisely what we shall all suffer if we do nothing.